What are financial ratios and how can you use them to evaluate a company for your personal investment? In this article, we will explore a few key ratios that can help you assess a company for investment potential. So what are financial ratios? Imagine going for a blood test as part of a medical examination. Your blood sample will be sent to a lab for analysis, and the results will be compiled into a medical report. The medical report would indicate a list of different numbers or ratios. For instance, if your total cholesterol to HDL (good cholesterol) ratio is less than 4.51, you are considered healthy. Similarly, financial ratios are simply relationships between numbers. Let’s explore a key ratio, ROE, for a start. ROE is Return on Equity. It is the Net Income to Equity ratio. Equity is how much shareholders have invested in the company as share capital. It also includes the amount of profits that the company has made and not paid out as dividends. In other words, its retained earnings. Together, they represent the amount of shareholder funds that have been committed into funding the business. Net income is how much profit the company has made, net of taxes. If net income is $10 million, whereas equity is $100 million, then ROE will be 10%. In other words, the company will take on average 10 years to recover its capital invested. If, on the other hand, ROE is 20%, it takes the company only 5 years to recover its capital invested. Hence, you can see that ROE is a powerful concept in assessing company profitability. Minimally, you would want to invest in a business that has atleast a double-digit ROE to make it worth your while. Recall earlier that retained earnings represent profits that the company has made and not paid out to shareholders as dividends. The payout ratio is computed as Dividend/Net income. So, if the company is paying out 70 cents for every dollar of profit it made, the payout ratio would be 70%. Conversely stated, the Retention Ratio is equal to 30%, which is simply one minus the payout ratio. This means that the company is retaining 30% of its profits as reinvestment into the business. Now we are ready to put the ratios together to good use. If a company’s ROE is 20%, and its retention ratio is 30%, at what rate is the company likely to grow its earnings? The answer would be 6%, since 30% of what is retained will be growing at the rate of ROE of 20%. You can determine if you are satisfied in investing in a company with such a growth rate. 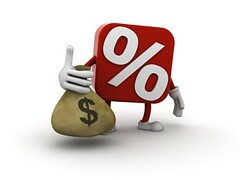 The company will declare a certain amount of dividends it will pay for every share that you own. If you take this number and divide by the current share price, the result is the Dividend yield. While the ROE measures how well management is deploying shareholder funds as a whole to earn a profit from a total company perspective, the Dividend yield allows you to make certain comparisons between investing in bonds, REITs (Real Estate Investment Trusts), money market funds or simply leaving it in fixed deposits. Should you select to invest in a company with a high or low dividend yield? As a guide, if you invest in a blue chip stock that pays you a dividend yield higher than the fixed deposit rate, you should be much better off. However, since fixed deposit rates are so low now, it is not hard to beat. The other benchmark would be to earn a yield higher than the government bond rate. The threshold should be higher, and you should expect to be compensated for taking a higher risk of holding to a stock as compared to a bond. On the other hand, be careful if the dividend yield is too high. This could mean that the company is paying out too much dividend and not reinvesting in the business, which is not sustainable. The other possibility is that investors do not feel confident about the company and therefore only willing to pay much less for the stock, thereby driving down the share price. About the Author: James Leong C. Foo, Chartered Accountant, is CEO of VisionsOne Consulting Pte Ltd. and Adjunct Associate Professor with National University of Singapore. His highly popular workshop, Finance for Non-finance Managers, coaches managers and executives on using financial numbers to drive their business better. James can be reached at jamesleong@visions1.com.sg. Dividend are what shareholders receives as a part of holding in a company.Got to learn interesting facts on dividend yield, return on earnings here.Traders can improve their returns from market by using trading tips, mcx tips while they trade in market.